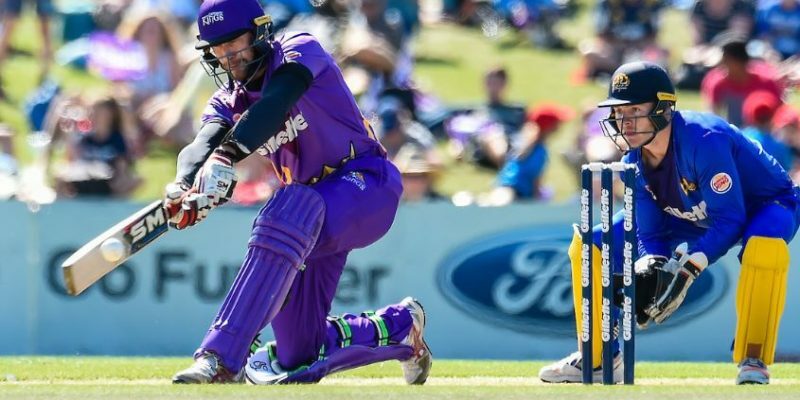 It’s been a while coming but the Canterbury Kings have gotten their first win of 2019 and their first home victory of the Super Smash, as a commanding knock from Stephen Murdoch and an inspired new ball spell led them to a comfortable 30-run defeat of the Otago Volts at Hagley Oval. On a pristine day in the Garden State the Kings’ batting clicked together, with Murdoch’s aggressive half-century backed up with a solid 40 by Chad Bowes leading them to a competitive 172. In return the Volts never got out of first gear, with Ed Nuttall and Kyle Jamieson scything through the top order to have Otago 20 for 4 early on. From there they were chasing the match, and were eventually bowled out for 142 in the final over to give the Kings their second win of the season and break a six-match streak. The Kings re-group for their last match of the season against the Firebirds next Saturday at the same venue, where a win for them and a loss for the Volts, who take on league-leading Knights, could see them finish fifth. With the Kings inserted into bat, openers Chad Bowes and Tom Macrury got them off to a positive start, playing with good intent in the opening overs. Macrury made his first runs in purple before holding out to square leg, as the Kings reached 43 for 1 at the end of the powerplay. From there, Murdoch and Bowes put on 50 for the second wicket in 39 balls as the Kings upped the tempo. Bowes peppered the off-side, with four of his five boundaries coming through the cover and point regions. Murdoch meanwhile got his innings going straight away with a couple of leg-side sixes off Anaru Kitchen as Canterbury reached 71 for 1 at the half-way stage. The stand was broken when Bowes was caught at cover with the score at 92 in the 13th over, but Murdoch continued on his way, bringing up his fifty off 33 balls. He went past his previous highest T20 score of 54, smashing another couple of sixes over mid-wicket, whilst also hitting well down the ground. Murdoch put on 38 off 20 balls for the fourth wicket with Cameron Fletcher, before lobbing a delivery from Jacob Duffy to the third man. That wasn’t before he had given the Kings the impetus for a strong total, having made 64 off 38 balls. Kyle Jamieson was duly promoted and the strategy proved effective, as some late blows ensured the Kings finished at 172 off their 20 overs. Any thoughts Otago had of chasing down the target of 173 had evaporated within the first five overs. Jamieson’s brilliant season continued, as a short delivery got too high on Hamish Rutherford, who top-edged a pull shot to Andrew Ellis at fine leg to give the Kings their first wicket in the second over. Ed Nuttall came out bowling with nice pace, and was rewarded straight away when Neil Broom held out to Ellis again at mid-on. When Josh Finnie and Tasman-Jones also held out to awkward pull shots down the ground, both seamers had two wickets apiece, Ellis had three catches, and the Volts were reeling at 20 for 4 in the sixth over. The Canterbury seamers used the pitch to their advantage, as the Volts’ top order had not made an assessment of the amount of pace in the pitch early in their innings and were made to pay the price, suddenly left with a required run rate of 11 with only six wickets in hand. Anaru Kitchen and wicket-keeper Ben Cox had to recover the innings from a precarious position, putting on 42 for the fifth wicket in 34 balls. When Kitchen was caught on the boundary off Cole McConchie, Otago had reached 62 for 5 mid-way through their innings and were in real trouble. Cox did his best from that point, striking 49 off 40 balls with three fours and two sixes, and putting on useful stands with Brad Wilson and Rippon to get Otago to 142, but there was simply not enough time for the Volts. It was to be the Kings’ day and such was their dominance, that Will Williams did not bowl until the 17th over and teammate Henry Shipley was not required to bowl at all during the innings. Nuttall finished with a very impressive 2 for 9 off his three overs, with good pace and bounce, whilst Jamieson came back to claim the last two wickets, finishing the match with four in total and continuing as the leading wicket-taker with 19 wickets to date.